Being able to communicate your current skill and experience to us before you arrive at Surf Simply allows us to plan your week of coaching to maximise your progress. “Intermediate” can mean anything from a few days, to a few decades of surfing, so instead we use the level 1-4 system. When you’re here, you’ll be learning along side one or two other surfers who are at the same level as you. We never mix ability levels within groups. Here is a summary of which skills are specific to each level. Level one coaching begins in the forgiving white water. You won’t be out of your depth until your comfortable to do so. You’ll learn how to select and catch waves unassisted; how to stall and accelerate the board; the difference between trimming and carving turns; and the functional stance which will allow you to perform big turns and progress onto catching unbroken waves during your stay. Level 3 surfers can consistently catch head high waves without assistance. So most of the coaching is done with the video camera, allowing you to see what you are doing on the face. We start with how to find the fastest trimming line, then how, why and when to perform horizontal carving changes of direction (cutbacks), then it’s about climbing on top of breaking sections (floaters). Level four video coaching is about performing committed maneuvers, in the critical part of the wave, with speed power and flow. 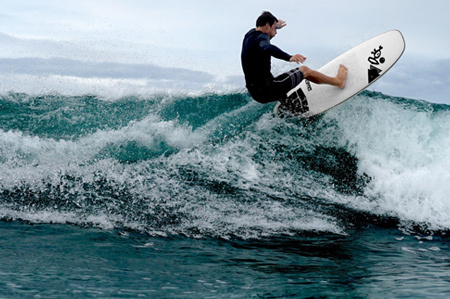 We establish which areas of your surfing are the limiting factor. Then you’ll learn which skills are relevant to you so you can break your free surfs up into productive bite sized drills. The aim is that you will leave being able to fault find and self coach by watching video of yourself in future.